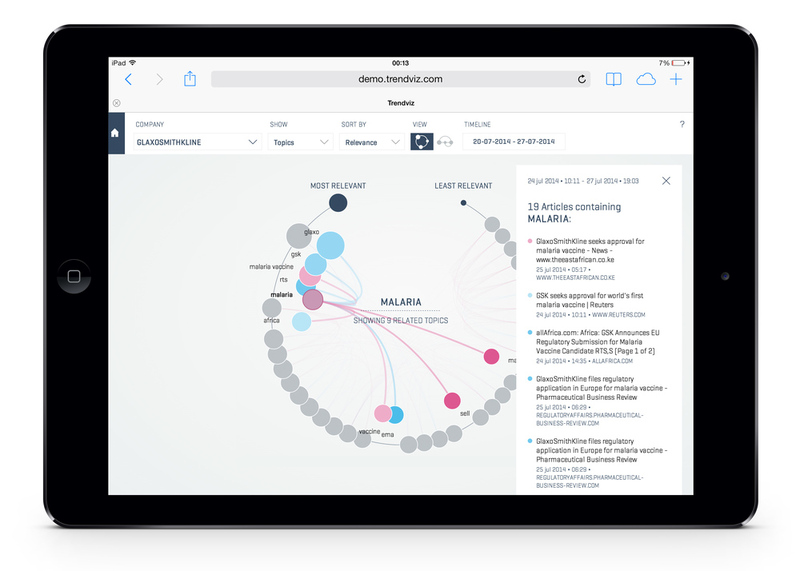 TrendViz showcases how data analysis of online news articles and social media messages can be visualized in an intuitive way presenting patterns, relations and tone of voice relevant to you. TrendViz provides a bird’s eye view of the important trending topics in online news defined by your keywords. Keywords can be any term concerning your brand, organisation, market or any other topic of interest. At the same time, TrendViz allows you to dig deeper into the data by means of a visualization-driven data discovery tool. Keep track of the online presence in online news of your brand, organisation, market or general topic of interest. Processes data in real-time and helps you unveil and discover new trends and sources whenever you need it. When the amounts of data for an organisation are expanding, the organisation needs to have these processed in a timely fashion and the data comes from an increasing amount of different sources, the challenges faced are those of “Big Data”. Enormity in any of these dimensions has led to a categorization of Big Data challenges in terms of the four V’s: Volume, Velocity, Variety and Value. We are convinced that only with an intermediate V: the V of Visualization, Big Data technology can be utilized to create actionable insights that enable the V of Value. TrendViz is designed to combine as many data sources as needed: sources such as social media, blog-posts and online news can be used. ‣ Complexity simplified. Gain insight in topics and relationships relevant to you, from news media and official buzz to voice-of-customer. ‣ Approach markets based on insight, plan ahead based on demand, improve features based on desirability, cater to your customers in the way they prefer. ‣ Interactivity enables users to analyse information from meta down to source level. TrendViz has an information extraction process that extracts the articles from the underlying sources and expresses them in a structured form, suitable for analysis. General statistics are obtained from frequent patterns and correlation analysis are used to disclose reliable hidden patterns and knowledge from the data. Using a set of proprietary visualizations, organisations can view, interpret, and interact with data from a multitude of sources. ‣ Explore data easily and understand it more fully. ‣ Enable real-time data analysis. ‣ Support real-time creation of dynamic, interactive presentations and reports. 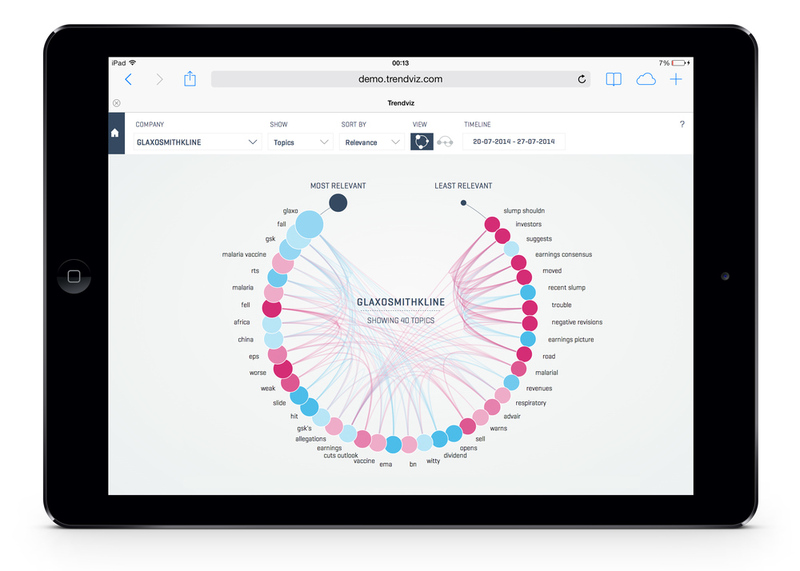 ‣ Showcase relationships, patterns and allow exploration of the data. ‣ Enable faster, more effective actionable insights. We’ve entered the era of Big Data. Through better analysis of the high volumes of data, there is potential for making faster advances in many disciplines and improving the profitability and success of businesses and organisations. We are passionate about the possibilities of combining big data analysis and powerful visualization. We want to keep improving and innovating, delivering more and better data discovery products.